Covering the first swimming events at the 2016 Rio Olympics is an experience UT student Akshay Mirchandani will never forget. He had been sent on assignment by the Pittsburgh-Post Gazette to cover Leah Smith, a 21-year-old competing in the 400-meter freestyle. Following her third-place win, Mirchandani knew he had to grab an interview with the Pittsburgh native. In an attempt to speak with Smith before she left the arena for good, Mirchandani says he rushed to grab his stuff, ran outside of the media area, and huddled with the rest of the journalists all attempting to ask the athletes just one or two questions for their stories. Luckily, Smith was walking with a media representative from team USA communications, so Mirchandani not only got to flag her down for a brief interview, but ended up writing the front-page story for the Gazette in just 45 minutes. Twenty Longhorn athletes and five coaches are currently participating in the 2016 Rio Olympics. And for those of us who can’t make it to the games, a group of UT journalism students is helping to bring the action back home. Four current and former student journalists—Cat Cardenas; Jasmine Johnson, BJ ’16; Jacob Martella, BJ ’16; and Akshay Mirchandani—are in Rio reporting on the games. The initiative to bring student reporters to the Olympics was an idea by R.B. Brenner, director of the School of Journalism, and professor Rosental Alves, who helped set up the students as volunteer workers for the Rio 2016 website. 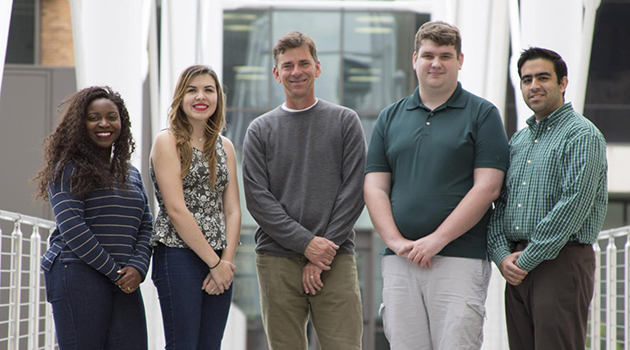 The students are led by Kevin Robbins, a senior lecturer in the School of Journalism and a renowned sports reporter, who will stay with the reporters in Rio until the games end. Since the games began on Aug. 5, Longhorn Olympians have taken home six gold medals. Mirchandani spoke with the Alcalde about his experiences writing on a worldwide broadcasted event, stepping out of his comfort zone as a reporter, and how covering the 2016 Rio Olympics is helping him grow as a sports journalist. Alcalde: How is Rio so far? Akshay Mirchandani: Rio is good. It finally kind of sunk in that we’re here and that we’re doing this. They’re not going easy on us. We have a lot of assignments and a lot of work. This is my first day where I get the chance to rest up a little bit, but I’ll be right back at it later this week. It’s been an incredible experience just to be at the center of this world event and to cover all these different athletes. So are the four of you are divided into covering certain events at the Olympics? For some of our time here, we’ll be helping out with the Rio 2016 website. The other part of this trip is that we take assignments from newspapers across the United States. Yesterday, I covered Leah Smith, a 21-year-old from Pittsburgh, Pennsylvania, for the Pittsburgh-Post Gazette. She ended up winning a bronze medal in the finals, and that story I wrote on her went on the front page of the sports section this morning. I also covered Jimmy Feigan, a UT alumnus and a San Antonio native. He was swimming in the preliminaries of the 4×100 yesterday, so I wrote something on that for the San Antonio Express-News. Was there any hesitation in going to Rio considering some of the health and safety controversies? For me, not really. This is such a once-in-a-lifetime opportunity that you just have to put that out of your mind. For me, the health things didn’t concern me as much as other things that might happen in terms of crime or terrorism. But even then, there was never a doubt in my mind that I was going to be here. What events have you covered so far and how is covering the Olympics different from college sports? I watched Venus Williams play tennis Saturday night, and even though she lost, it was a really fun, really exciting match. The only sport I’ve covered so far and have written about for papers has been swimming. However, assuming the people I write about advance, I should be covering a rowing event later this week. I’ll also be covering wrestling and track and field later in the Olympics. It’s crazy to know that I’m watching a swimming race and that people around the world are watching the same race. For the story I wrote yesterday on Smith, I only had about 45 minutes after the race ended to send in my piece. There’s some tight deadlines depending on what time the event you’re covering is, but the best part of this trip is being able to perfect your craft and do things that are outside of your comfort zone. As a spectator, I definitely want to catch a Team USA basketball game. I’m excited to meet more people. I’ve met reporters from a couple of different outlets already so that’s been great. I’m actually not returning to UT until the spring, because I’m interning for Sports Illustrated in the fall in New York City. I’m hoping to meet some people from SI here and connect with them before I get there. I really want to use these next couple of weeks to network, meet people, and cover sports that I normally wouldn’t think to cover. As a sports journalist, how do you think this experience will impact you? Having that ‘Rio de Janeiro’ line under my byline means a lot. Just knowing that I’ve covered the Olympics gives me a lot of confidence in terms of trying to find a job and trying to find something to do after college. This experience also helps me broaden my portfolio and my contact book, and I think that it’s so tough to put a value on that. This experience is definitely priceless.